The huge dinosaurs that roamed the world 225 million years ago have long been a source of fascination. Monsters in every sense of the word, some reaching up to 90ft long and weighing as much as 20 tons, these primitive mammals existed in various forms for a period of 130 million years before becoming extinct. Two examples were Tyrannosaurus Rex and Triceratops. Now these two creatures enter the Airfix kit range to bring to modelling a further extension of the educational aspects of the hobby. 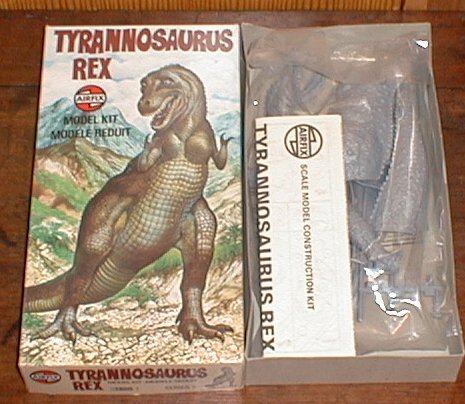 Tyrannosaurus Rex or 'tyrant lizard' was the most fearsome of the dinosaurs and in that primitive period reigned supreme. Triceratops too was a big lumbering giant but was somewhat slower than its stablemate and its name translated means 'three-horn face'. These kits are easy to assemble and great fun to paint and display.